Key System 187 in WRM yard. Key System 187 is a three-truck, two-car articulated all steel unit designed and built to run over the Bay Bridge. It has an arched roof and large fixed windows. 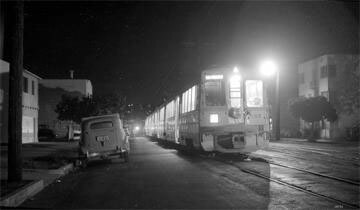 These cars ran in trains across the Bay Bridge and in East Bay streets from 1939 to 1958. This car is currently configured in the Key System (pre 1948) appearance. Bay Bridge service replaced ferryboat service from the East Bay to San Francisco in 1939. 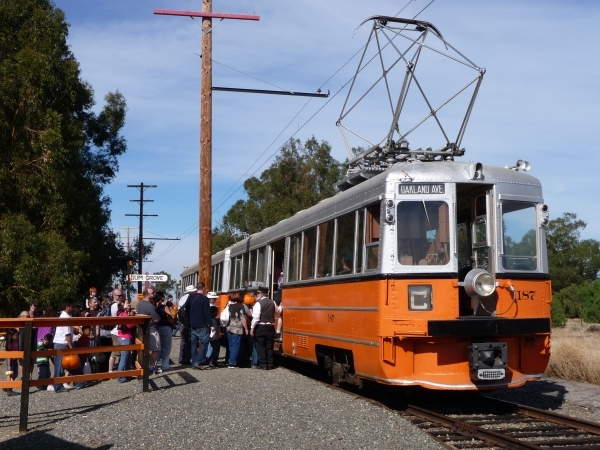 These units ran in trains of up to 7 units on five lines in the East Bay. They are equipped with coded cab signals and speed control. Some units were built using equipment from older Key System cars. All three of the Museum’s Units were made mostly from new equipment. In 1936 Key System entered into an agreement with the California Toll Bridge Authority to deed a portion of their equipment to the Authority in return for funds to provide cab signals, train stop equipment and other modifications for operation across the Bay Bridge. 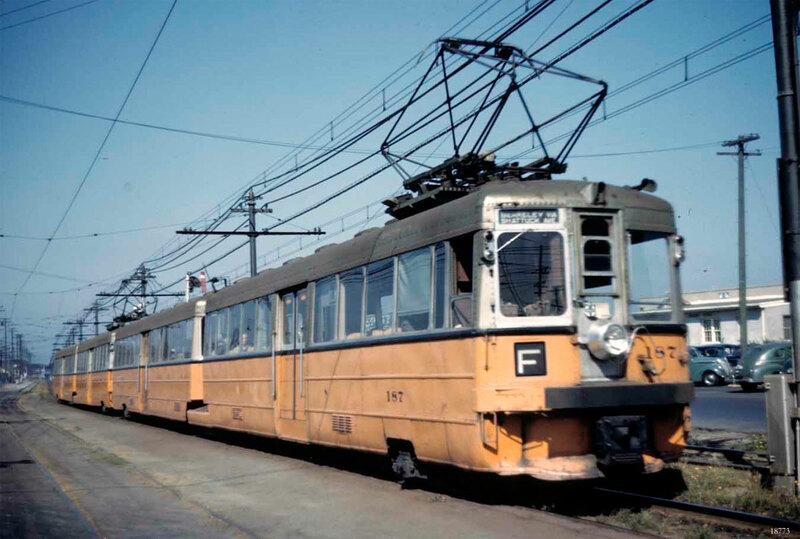 The 187 was one of these cars deeded to and passed to the Authority on abandonment of service in 1958. Technical Data: Articulated steel suburban car. Built by Bethlehem Shipyard, Willington, De in 1937. Seats, 140. Weight, 137,625 pounds. Trucks: Commonwealth. Wheels, 34-inch diameter. Axle. Journals, 5 X 9 roller bearing. Traction motors, 4-105 horsepower @ 600 VDC, inside hung. Air Brake Equipment: Westinghouse Traction Brake, AMM. Motorman’s valve, M24D. Triple valve, M2D. Brake cylinder, 14 X 12. Dead man on controller. Air Compressor, General Electric CP-28, one on each car. Clasp type. 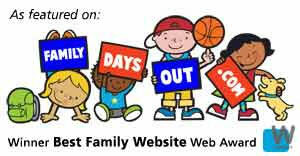 Dimensions: Width: 8’ 10”. Length over buffers, 110’ 6”. Height. Truck centers. Truck wheelbase, 80”. Propulsion Equipment: General Electric type M and Westinghouse Electric and Manufacturing Co. traction motors. Master controller, General Electric C6J. Switch group, General Electric DB 260. Traction motors, WE&MCo. 555C6. Traction gearing, bull 57, pinion 18, ratio 3.167 to 1, ? face. Control switch, MS-46. Power resistors, Edge wound ni-chrome. Motor generator, GMG-131. Misc Data: Couplers, Tomlinson hook style with bottom mounted button type electric portion. Heaters, Consolidated Car Heating. Pantograph, Westinghouse S-529. Third rail shoe. Air Horn and air bell. Current Condition: This car is complete, operational, and in excellent condition. Proposed Future Treatment: Maintain current status.